THE nuclear magnetic resonance (NMR) absorption in ferromagnetic materials is tremendously enhanced compared with that in all other substances. By far the most intense NMR absorption yet reported is that of the Co59 nucleus in bulk cobalt.1• 2 At room temperature, the internal magnetic field at the cobalt nucleus is about 210 kG. The nuclei precess in this field at 213.1 Mc, and will absorb energy at this frequency from an rf oscillator coupled to the cobalt sample. No external magnetic field need be applied to the cobalt; a strong external field will in fact destroy the resonance. All that is required to observe the resonance is some powdered cobalt, and a low-powered rf oscillator equipped with a meter which indicates grid current, i.e. a “grid clip” meter.3 Ordinarily, the tuned LC circuit of the oscillator is unloaded, and the grid current is relatively high. When energy is absorbed from the tuned circuit of the oscillator by a nearby resonant circuit, the grid current shows a dip. With a model 59 Megacycle Meter,4 the curved end of the tuning hairpin need only be held flat against the bottom of the bottle of cobalt. As the oscillator is tuned carefully through 213.1 Mc, a small clip of grid current will be observed. The absorbing “resonant circuit” in this case is the system of Co59 nuclei. The 213.1-Mc resonance arises from nuclei of atoms located in the abundant face-centered cubic crystal structure. Nuclei of atoms in the less abundant hexagonal closepacked structure see a slightly larger magnetic field, and therefore resonate at about 221 Mc. 5 If a little cobalt is placed just inside the curved end of the hairpin, the 213.1-Mc absorption dip will become stronger, and it should then be possible to discern the 221-Mc absorption as well. Some weaker resonances are also present, but additional equipment is usually needed to see them. The 213.1-Mc resonance can be seen with the Heathkit model GD-1B grid dip meter. A grid dip meter is normally coupled weakly to the circuit under test, in order to avoid mutual detuning, and the frequency dial is calibrated accordingly. The proximity of the bulk cobalt to the hairpin has two gross effects on the grid dip meter, in addition to providing resonant absorption of nuclear origin. Firstly, the added stray capacitance reduces the oscillation frequency by roughly 5 to 10% below that indicated on the dial. Thus, to obtain oscillation at 213.1 Mc when the cobalt is in place, the dial has to be set at some higher reading. The actual frequency has to be measured by standard techniques. 6 Secondly, resistive loading of the oscillator reduces the amplitude of the rf oscillation, and may stop it entirely if too much cobalt is brought too close. The best NMR sensitivity is obtained when oscillation is barely sustained. Only the cobalt resonance is detectable by the means described here. The sample used in the present work was 300 mesh, assay 98% minimum, Ni 0.6%, obtained from the Fisher Scientific Company (catalog number C363). 1 A. C. Gossard and A. M. Portis, Phys. Rev. Letters 3, 164 (1959). 2 A. M. Portis and A. C. Gossard, J. Appl. Phys. 31, ZOSS (1960). 3 See any recent edition of the annual Radio Amateur’s Handbook (American Radio Relay League, West Hartford, Connecticut). 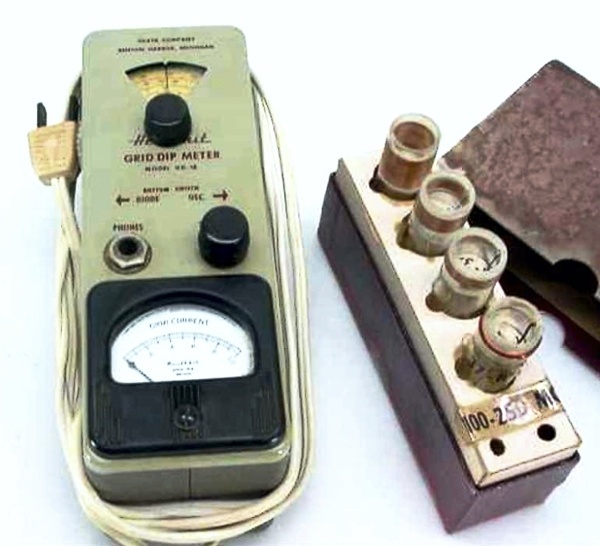 4 A grid dip meter manufactured by the Measurements Corporation, Boonton. New Jersey. 5 R. Street, D.S. Rodbell, and W. L. Roth, Phys. Rev.121, 84 (1961). ‘F. E. Terman and J.M. Pettit, Electrnnic Measurements (McGrawHill Book Company, Inc., New York, 1952), Chap. S.